It all started when I wrote the letter, immediately below right after the Manitoba election in April. It was published in the Neepawa Banner and Roblin Review. It prompted an angry response in "The Review" from Brian Burtnack, which appears right after that. Then, my own response to Mr. Burtnack. I've numbered the letters 1,2,3 & 4, putting them in chronological order. While I'd love to give him the benefit of the doubt, let's face it, this is no "oversight." And it's hard to view it as anything but act of an utterly contemptuous climate denier. In a ten-year period, Enbridge of Calgary recorded more than 600 spills of crude oil from its pipeline into the States. 132 thousand barrels escaped, fully half the amount spilled in the infamous Exxon-Valdez tragedy in 1988. Then, in 2010, 2.4 million litres of bitumen (tar) spilled from an Enbridge facility into the Kalamazoo River in Michigan. That cleanup has proven incredibly difficult, lengthy and costly and was the worst spill of its kind, ever. Last July, five million litres of bitumen mixed with water and sand, leaked from a pipeline south of Fort McMurray, It proved to be one of the biggest oil spills in Alberta’s history. Oh, and just last month, there was a spill of more than 70 thousand litres of crude from TransCanada’s Keystone pipeline in South Dakota. In Russia, an oil pipeline ruptured under a river recently, causing a huge explosion and fire. 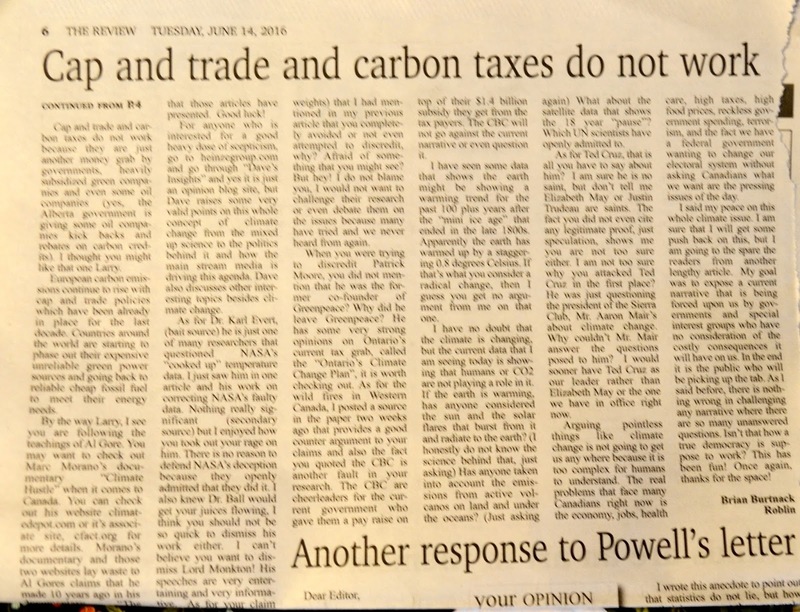 First let me apologize for using the word “stupid” in my initial letter to describe those who dispute the science of climate change. It arose out of my frustration and passion for the subject. You obviously took a good deal of time and care drawing together the details contained in your reply, Brian. But let’s boil down what you are asking us to believe; that thousands of the world’s ranking experts on climate change and wildfires, many with PhDs, peer-reviewed studies published in highly-respected journals, years of experience in the lab and in the field, not to mention institutions like NASA, the U.S. military and the Pope (and folks like me who try to accurately spread their message, I guess), should all be written off because we've been conspiring to tell one big lie! Seems a tad far-fetched, doesn’t it? After all, that’s a lot of collusion! Surely distrust of this magnitude betrays a level of paranoia that’s a bit off the charts. To believe that we “shady characters” somehow “cook the books” to hide the bundle of “truths” put forward by your camp, Brian (that the planet is actually cooling; polar ice caps and glaciers are actually expanding; sea levels are not rising and wildfires are no worse than they’ve ever been), surely requires a pretty high level of gullibility. I hope you’re not asking us to believe that the “before” and “after” photos and videos - all now so common in the news and on the ‘net - that clearly show glaciers and icecaps melting at an alarming rate, coastal areas being flooded and low-lying islands being overwhelmed because of sea-level rise, and polar bears clinging to vanishing ice-flows have all been doctored or “Photoshopped” are you Brian? Really? You are right about one thing, tho. Our forests have been burning for thousands of years. To which I’d politely respond, so what? Have you ever heard anyone say otherwise? Believe me, I’ve heard this one before: Cook up an argument or point of debate that no one is disputing! The point is, as the planet heats up dangerously (since it has been doing since the beginning of the industrial age), it is creating tinderbox conditions in our forests that are getting worse.This makes wildfires start earlier, last longer and burn more fiercely. 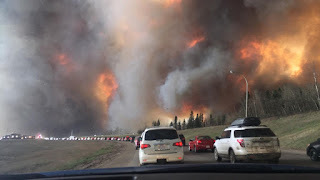 Here is what the world’s leading authority on global warming, the Intergovernmental Panel on Climate Change (IPCC), said a few years ago; “In the boreal zone of Canada, there has been a marked increase in fire since about 1970. The area burned annually in western North America has doubled in the past 20 years.” While it did express some uncertainty about the climate change connection at the time, surely reasonable people will now view the ferocity of the Fort Mac fire as nothing but further verification of that connection. Then the IPCC went on to say, “Fire frequency is expected to increase with human-induced climate change.” Both the Panel and its individual scientists were awarded Nobel prizes for their work a few years ago. And Brian, there are several things you need to know about the sources you quote. 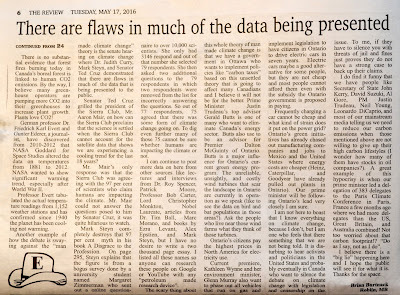 Tim Ball, who’s been the “go-to guy” for climate deniers in Canada for some time, once claimed he was “one of the first PhD climatologists in the world.” This is not true. When he graduated from the University of Winnipeg some 30 years ago, no climatology course existed. His degree was in “historical geography.” And none of the four research papers he has published since, has been in the field of atmospheric science. He’s already been sued successfully by at least one real scientist. And many of his outrageous comments that “climate change is good for us,” have been quietly removed from the right-wing blogs which published them. Ball and at least two other sources you quote, Dr. Friederich Karl Evert and Patrick Moore, have been frequent speakers at the right-wing, free-market think tanks, “Friends of Science“ in Canada and “The Heartland Institute” in the ‘States. Heartland, especially, has have received millions from the oil industry and the Koch Brothers. They've become multi-billionaires through their extensive holdings in polluting "smokestack industries," oil, gas and coal. They've devoted their lives to putting down environmental causes and funding extreme right-wing groups, like the Tea Party. And, by the way, Dr. Evert did not discover that NASA had tampered with temperature records, as you claim. He alleged it had done so. Words come cheap. If you have solid evidence to support the good doctor, please provide it. Another of your sources, Dr. Roy Spencer, accepted $4,000 from an energy company to testify at a state hearing in Minnesota on the impact of carbon dioxide. Then there’s Christopher Monkton, “Third Viscount Moncton of Brenchely.” Lord Monkton is a British politician who once claimed he had received a Nobel prize in the field of climate science, then admitted that he’d been making a “joke.” Some joke! If we are all to work together to build a better future, we need to rely on the best, most solid evidence available to make that transition to a low carbon economy. Brian, this is not it! Here’s something else you need to be aware of. Several scientists with major oil companies (notably Exxon Mobil) were themselves warning their own bosses back in the eighties that the product they were producing was dangerous to the planet. Why would they do this? So they could lose their jobs? It makes no sense to assume they would fabricate such a thing. Those companies ignored this advice and embarked, instead on a cover-up, often engaging phoney “front groups” to plant seeds of doubt over whether the science of climate change was really settled. U.S. justice officials are now investigating those corporations for criminal wrongdoing. And, by the way, Senator Ted Cruz, who you also believe has something credible to say on this topic, has taken the side of these big, rich, powerful, shady corporations, against such an inquiry. All this despite lots of damning e-mail evidence pointing to their guilt. Many comments have been made on social media about the Fort Mac fire. Some have undoubtedly been insensitive toward the unfortunate residents who have lost so much in that terrible tragedy. 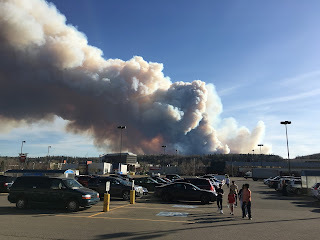 Many other comments, directed against those who support the “wildfire-climate” connection, have been angry, breathtakingly uninformed and ugly. Trust me. I know. 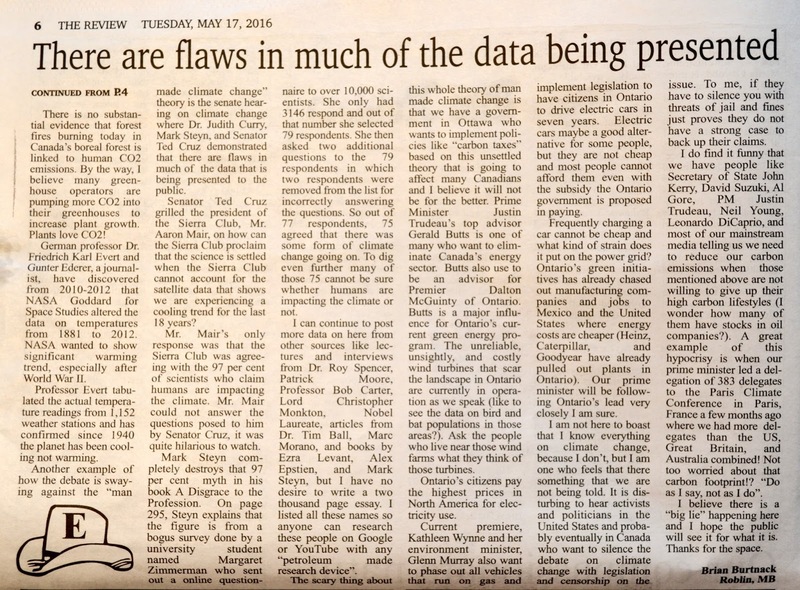 Green Party Leader Elizabeth May was called unfit to be Canadian, a “b….” and worse, because she simply cited the best science available when asked about that connection. She was doing what any MP worth her salt should do. She "spoke truth to power," and paid the price for it. We need more like her. Finally, please explain to me how is it that those of us who recognize this now well-established connection, are the ones being accused of being callous and insensitive to the residents? Speaking for myself, I just want to see a better way for these individuals who have suffered so much, to work in a field which makes our world less reliant on petroleum in the future. Yet those who would barge ahead with business as usual, ignoring the science, surely sentencing these poor people to still more "Beasts" down the road, are somehow their true friends? Then, my own response, again. 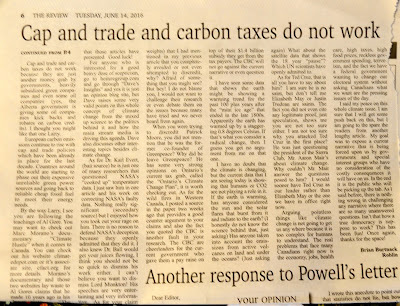 Re: “No solid argument to back up Powell’s claims” by Brian Burtnack in the June 14th Review. Wow, Brian! This is getting to be a habit! But don’t get your hopes up! I’m not writing this for you. I’ve given up on you. Because you’ve made it abundantly clear that you have hardened your heart and closed your mind to anything that resembles reason, logic, evidence or science and everything to do with conspiracy, distrust and paranoia. So spare yourself the effort of reading any further. Because that might set you off on another nonsensical diatribe. And what purpose would that serve? No, I’m directing this instead to my fellow citizens who are actually still open to the best information available so they can properly prepare themselves and their children for a world that is already descending fast into a climate crisis. In doing so, I lay no claim whatsoever to having a corner on “truth.” I’m merely a messenger. I’m just a guy who survived and even thrived for 40 years as a journalist. And I did not do it by screwing up the facts or relying on crackpots, charlatans or “rebels without a clue” for the sources of my information. As we speak, extreme weather is, yet again, wrecking havoc in many parts of the world. The town of Dawson Creek, BC has been cut in two after the “creek” which runs through it, turned into a raging torrent. A state of emergency has been declared. Homes are flooded, cars and roads are washed away. The creek was fed by “unprecedented” (never-seen-before) torrential rains. And that is what the locals are saying, NOT ME. Serious flooding is also being reported in parts of China and Indonesia. Heat waves described as “rare, dangerous and deadly” are ravaging parts of Arizona and California. Temperatures there are in the high 40s! Terrible wildfires rage out of control once again, this time around Santa Barbara. Sicily is suffering similar, searing heat. Arsonists with the Mob there are preying on tinder-box conditions laid out by a warming planet, igniting terrible wildfires and causing misery for many. Oops, I lied! I DO have one more comment for you, Brian. Apparently you would now have me add the CBC to your growing list of “corrupt” organizations. By extension you will also have to condemn the New York Times, the Washington Post, the Manchester Guardian, the Globe and Mail, elite scientific publications like Nature, Scientific American, not to mention a courageous new, Canadian online service which I’m proud to support, called the National Observer. Sorry to break the news….but they, too now SUPPORT THE SCIENCE OF CLIMATE CHANGE. Thanks, once again for the space, Ed! RELATED: "The Great Wildfire Debate Lights Up Editorial Pages in Manitoba"